In a previous post, I skimped on the details about the lightning talk strand at Dev8D. Time to sort that out, starting with a definition of “why”. Lightning talks should provide enough information, presented concisely, to interest, inform, bootstrap and otherwise start people talking about something. A 3 to 5 minute talk with or without slides and props is more than sufficient for this. A lightning talk should not do the job of the internet. Give an overview of something, and share the URL. Don’t seek to talk through all the text on the site. or a taster of something that you feel passionately about. Straightforward. But this only considers it in one direction. What about the audience? The audience needs to be given the mental space and time to digest, note and take in the information presented, especially for these short, dense talks. I think this is key. In my own limited experience, I have found too many events that use lightning talks as a means to cram in as many talks in as possible. I tend to remember one, maybe two of these and even rarely remember the URLs I’ve been given. I just didn’t feel I had the time to make good notes or good decisions about whether or not this information was actually useful to me. The URLs would remain as tabs on my browser for a while, until I forgot even why I had them open. Let’s work in some space into the schedule then, where nothing happens. Nothing formal, anyhow. You’ll have time to talk, ask questions of one another, talk to one of the speakers or, give yourself a break and do absolutely nothing. Not everyone can ‘sprint’ through information and take it in at the same time. The other strands of the event are mostly portioned into blocks of an hour in length, so it makes sense to organise the talks in a similar fashion. It’s not a sensible idea to join a workshop halfway through for example, unless the workshop has been built around that idea. Scheme B: (8 talks/hr) Same as A but with more leeway given. 4 talks and then a large break, which due to human factors won’t be 12 minutes in reality, but should be at least 5 minutes in length. Getting better, but how about if we split the talks up a little more. Scheme C: (still 8 talks/hr) scheme B split into paired talks. 4 sets per hour, with two talks per set. (It would be interesting for the topics of the paired talks to complement each other in this scheme) It provides a good spacing of talks, leaving the gaps required for people to be comfortable sitting, processing what they have just heard. Scheme D: (6 longer talks/hr) Essentially, scheme B with 5 minute talks. More space to talk through a topic or idea, but might also give enough time to be responsive to audience queries or directions. 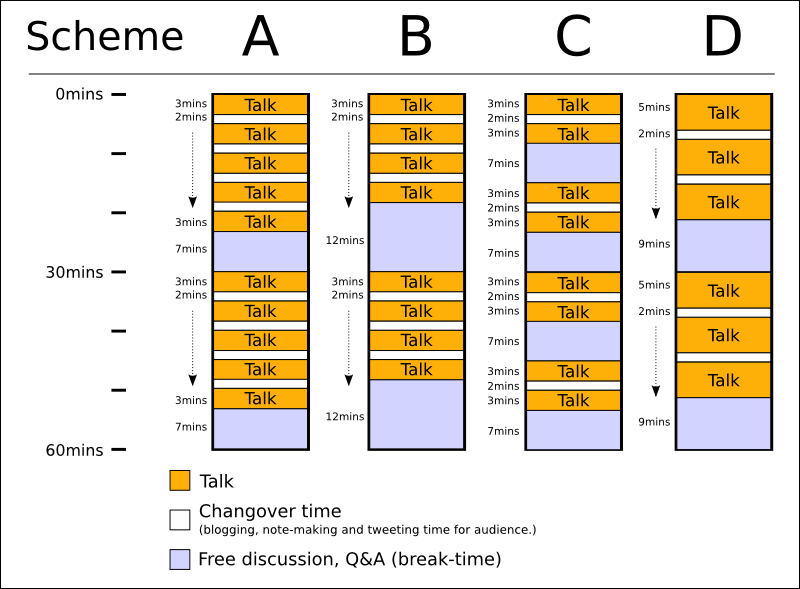 There is also a scheme E – “Normal talk series” – 4 x 13 minute, 3 x 18 min or 2 x 28 minute talks. These I didn’t think I’d have to illustrate. During the first period of the day (‘Core Skills‘) -> Scheme D: 3 five minute talks per 30 minutes, shifting to 2 talks (skipping the middle talk) per 30 minutes if that makes more sense. This is because I expect that people won’t be so talkative at this point in the day, and more prone to sitting and taking in information. During Lunchtime and ‘Emerging Technologies‘ period, scheme C: 2 three minute talks per 15 minute blocks. During the final part of the day, ‘Pushing Ideas Further’, this will be flexible, but allocation will begin in the scheme D pattern. Pre-planned talks will happen earlier in the day, with more open spots appearing later on that is available to anyone who wants to talk on the day. This will mirror the theme of the conference as a whole; starting with our guess of what might be useful to you and ending with your choice of talks and conversations that are useful to you. Please, add comments below if you agree, disagree, hate, or just don’t care. ← Only 3 out of 28,000 teachers awarded QTS in 2010 have computer-related degree? Er, no. Otherwise, I think the ideas are good. I think having a mix of talk lengths to sign up for would be good, too.